By Michael Bowman (VOA News) WASHINGTON – CAPITOL HILL — The U.S. Senate on Thursday completed its most momentous week on climate change in years, loudly swatting down an ambitious proposal to overhaul America’s economy to halt carbon emissions, while at the same time taking baby steps toward bipartisan agreement on the threats posed by a warming planet. The Republican-led chamber on Tuesday rejected the Green New Deal, a resolution to stop greenhouse gas emissions by 2030 and rewrite America’s social contract through a vast expansion of federal mandates. Despite the defeat, environmental activists found reasons to cheer. “We’re delighted to see momentum in the U.S. Senate — this debate on climate change has been largely stalled for some while,” Elizabeth Gore, Environmental Defense Fund senior vice president for political affairs, told VOA. 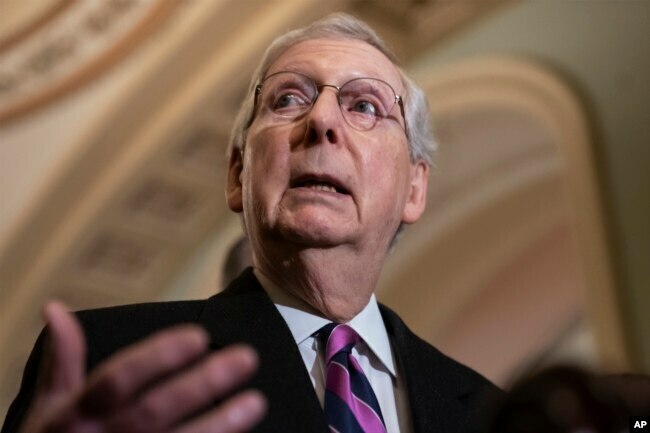 FILE – Senate Majority Leader Mitch McConnell, R-Ky., speaks to reporters on Capitol Hill in Washington, Feb. 26, 2019. Republicans lambasted the Green New Deal as a socialist pipe dream, arguing that eliminating combustion engines in a decade would destroy the U.S. economy and eradicate many Americans’ way of life. “We need tractors to plant our crops. We need combines to harvest our crops. We need trucks to get it to the [grain] elevator — all of which are going to be pretty hard to operate if you don’t have fuel-fired engines,” said Sen. John Thune, R-S.D. 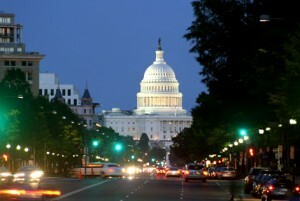 Instead of costly governmental intervention, Republicans urged an unleashing of American innovation. 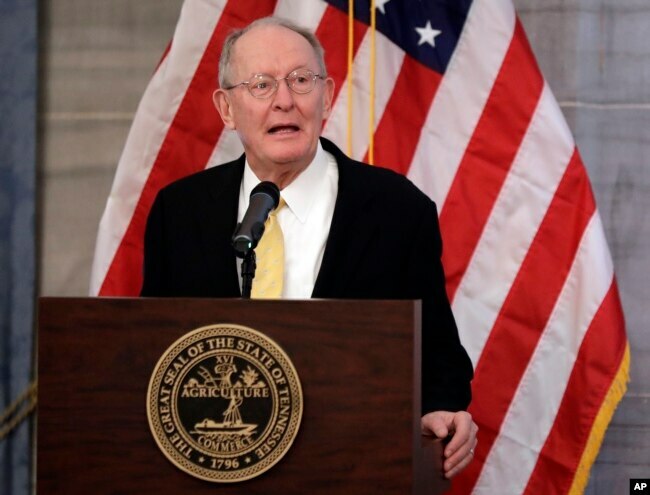 FILE – U.S. Sen. Lamar Alexander, R-Tenn., speaks Dec. 17, 2018, in Nashville, Tenn.
“We should use American research and technology to provide the rest of the world with tools to create low-cost energy that emits fewer greenhouse gases,” Sen. Lamar Alexander, R-Tenn., said Monday, when he unveiled a proposal to double federal funding for low-carbon and carbon-free energy projects and research. Senate Democrats mostly derided the Republican moves as too little, too late. 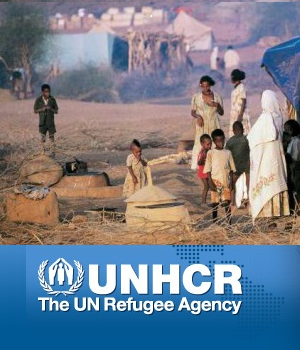 Others criticized an innovation-only strategy for combating global warming. 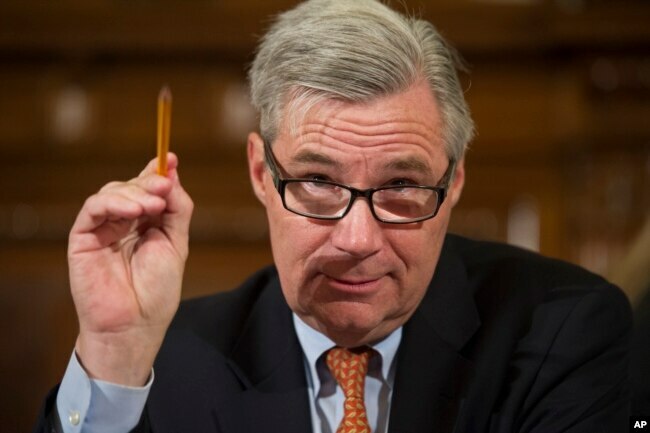 FILE – Sen. Sheldon Whitehouse, D-R.I., speaks on Capitol Hill in Washington, Jan. 11, 2017. By contrast, Gore applauded any nascent bipartisan meeting of the minds on climate change. Public opinion polls show Americans increasingly concerned about the effects of climate change, with a recent Reuters poll finding 72 percent of the public viewing warming temperatures as a threat. But Reynolds added that prospects for sweeping legislation were dim for now. Senate Democrats all but conceded that point in unveiling their caucus’ special committee on the climate this week, suggesting that action was unlikely, so long as they were in the minority. “The truth is, we’re preparing to lay the predicate for action when and if Chuck Schumer becomes the majority leader of the Senate,” Hawaii Democrat Brian Schatz told reporters. Moments after blocking debate on the Green New Deal, the Senate took up a bill to fund federal assistance to U.S. communities struck by climate-related natural disasters, from hurricanes to wildfires to flooding.